Silk Merchant provides a little bit of everything you want at the start of the game. It increases your payload with the on-gain coffer (which is really, really good at hitting early price points. Opening SM and silver, you’re likely to be able to hit 5 twice, or up to 7 once, on turns 3-4). It increases your deck control with the draw, and the Villager. The villagers it gives helps you pick them up without much fear, which you’d normally otherwise have with a terminal, even though it’s also a drawing card. 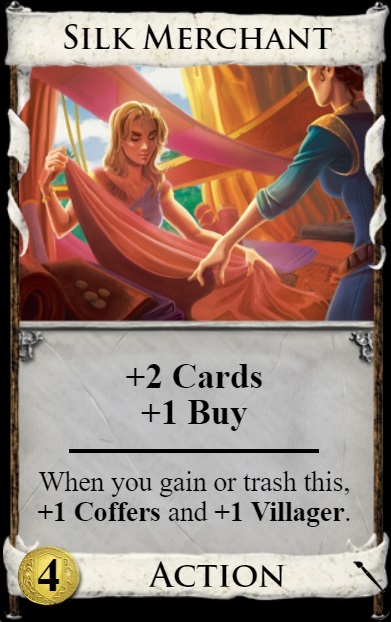 Extra buys are also something you want to pick up fairly often, and on Silk Merchant, you’re getting them on a card which already otherwise furthers your game plan, making the cost of getting that +buy quite small. Having said this, you can’t usually build a deck just from these – they are terminal draw, and if you spam these and only these, you don’t end up with much of a deck at all – you eventually won’t have enough villagers to play them all, and you don’t have much lasting payload. So you want to use the card more as a role player, combining with things like villages and economy in order to maximize your deck’s effectiveness. The on-trash effect is also a nice bonus and is usually quite strong wherever there’s something that gives you benefit for trashing a card (especially one which cares about the card’s cost). This entry was posted in Bite-Sized, Dominion, Tabletop Games on April 7, 2019 by Adam Horton. The split pile of Sauna and Avanto can provide three different deck control functions that are valuable in most games of Dominion: thinning, draw, and a village. In spite of the fact that it’s mediocre at providing each one of these effects individually, the fact that you can get all three of them makes Sauna/Avanto worth going for in many games, especially if it’s the only source or at least one of those effects. If you’re using Sauna/Avanto for trashing, you usually want to go for other sources of trashing first, unless those sources are prohibitively expensive. In the absence of other reasonable trashers, you’ll either want to open Sauna/Silver and hope for collision soon, or consider skipping trashing that game. If you want to draw cards with Sauna/Avanto, you’ll want to make sure you are in a situation to get lots of Avantos. Draw is what this pile is best at, so you’ll be in good shape if you build a deck to be ready for the Avantos when they show up. The main exception to this is when Sauna is the only village. If you want a village out of the pile, Sauna is pretty unreliable and inefficient at getting you there. You have to line up three cards to get that effect, and get lots of copies of both Sauna and Avanto. On top of this, you won’t get all of the possible actions every turn. 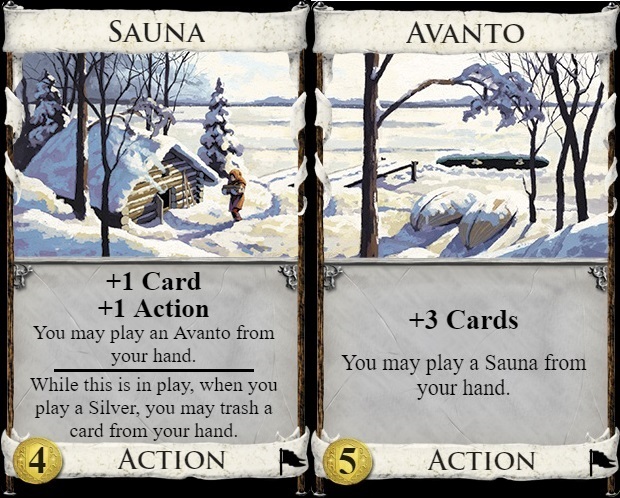 As a supplemental source of one or two extra actions each turn, or to support Avanto as draw, this is pretty good, but as the only village for supporting other terminals, Sauna usually doesn’t cut it by itself. 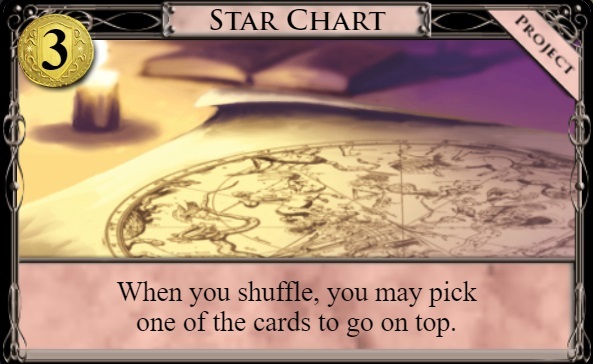 Star Chart’s effect looks innocent at first glance, but the consistency it provides is extremely valuable in the first few turns of the game, to the point where it’s difficult to imagine situations where it’s not worth it to get Star Chart within that time frame. Along with that, it continues to be valuable throughout the entire game. The most common situation for Star Chart is to open with it, ensuring that you see your other opening buy on turn 3. 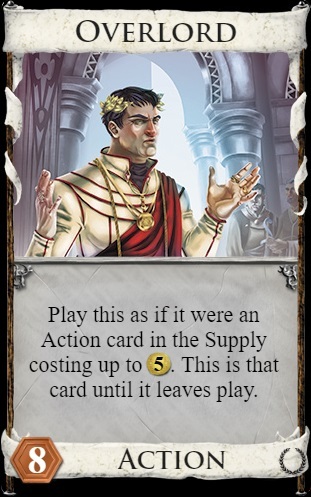 This makes opening with duration and reserve cards much better, and shores up the chance that a critical card misses the shuffle, which is frequently more valuable than buying another card in the opening. There are a few exceptions to this, the most notable of them being: a 5/2 or 2/5 opening, or maybe if hitting $5 on both of turns 3 and 4 is appealing. Even in these cases, you are likely to want to pick up Star Chart soon. Given that you have this extra piece of consistency from early on, you can build your deck more aggressively. The need to overdraw just for consistency’s sake is much less, and generally you can prioritize payload a little higher with Star Chart around. Scrying Pool is one of the few sources of unbounded draw in Dominion. In an action-dense deck, Scrying Pool can draw you an obscene number of cards without even using an action. This, coupled with the attack, makes a strategy based on drawing your deck with Scrying Pool much more powerful than it might seem on a lot of boards. Trashing your starting cards is one of the best ways to get an action-dense deck, so it can be worth delaying your Potion buy until after the opening to get started faster. Even in decks that aren’t action-dense, Scrying Pool is still worth going for, as it can still draw a significant number of cards, especially when you consider that the sifting effect for your own deck is often as good as drawing an extra card. It’s usually only skippable in heavily treasure-focused decks with limited gains, because in these games it takes longer to get an action-dense deck up and running and it’s more difficult to overcome a points deficit. 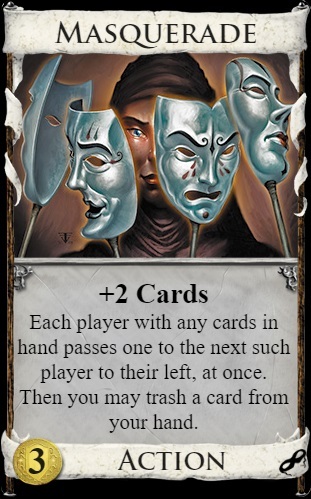 It’s easy to look at Masquerade and get too focused on the passing portion of the card, but this is not really what makes it powerful. Drawing multiple cards while being able to thin makes Masquerade a potent force for early deck control, and when you throw in its low cost, it winds up being one of the strongest cards in the game. It’s very rare that you can open with a card that allows you to thin your deck and also buy a good card on that same turn, unless of course you had a 5/2 opening. The passing portion of the card is not completely insignificant, though. You really don’t want to pass good cards to your opponent, which means you can’t get so thin that you don’t expect to draw at least one bad card in your opening hand. Masquerade also has synergy with discard attacks, because if you have actions remaining after making your opponent discard, there is still the threat that you will play a Masquerade, which will force them to pass you a good card unless they kept a bad card after getting discard-attacked. Teacher’s effect is extremely powerful because it offers the effect of a village, draw, and +Buy, all in the same card – you can almost always have some pretty great turns because of Teacher if you have enough time to set it up. 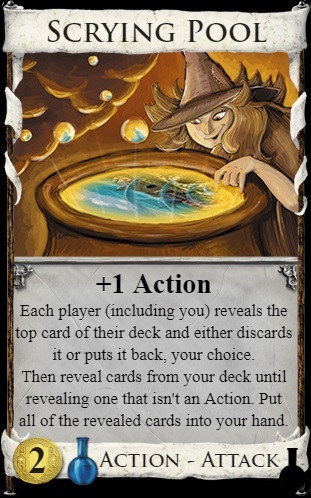 You’ll want at least two spammable cards for Teacher to be at its best, and of course one of them can be terminal if you’re OK putting your +Action token on it. 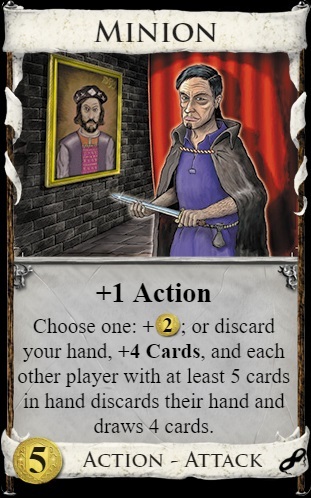 Disciple is an excellent card as well, and it has a synergy with Teacher: Disciple likes to double action cards and gain more copies of cards if they are enhanced by Teacher’s tokens. iIf you’re going for Teacher, you’ll want to pick up additional Peasants so you can have one or two Disciples along with your Teacher. Peasant’s main weakness is that it takes a while to get going. You can help things along with trashing and junking, but it’s unusual to get more than two of Teacher’s tokens out before the game is over. Soldier can help slow your opponent down, so when you’re not being contested with these Travellers, you’ll want to make sure to play two Soldiers each turn. Junking attacks in general are pretty powerful in Dominion, but Mountebank is able to potentially give out two cards worth of junk on each play, making it one of the most powerful junking attacks in the game. Even after the Curses are gone, Mountebank can still junk opponents by giving them extra Coppers. Decks with lots of Curses can dodge Mountebank’s attack, however, so after the first few plays, Mountebank’s attack can get less effective. To mitigate this, you may want to switch to another junker later on if it’s available, or try to play multiple Mountebanks in a turn if possible. 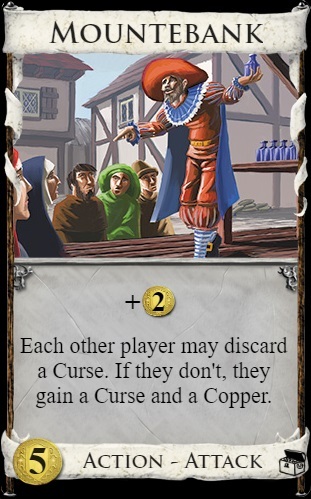 If your opponent has Mountebanks and you are faced with the choice of trashing a Copper or a Curse (which you may have a few copies of), consider keeping the Curse around to guard against future Mountebank attacks. Often times this can be better for your deck control, and this will outweigh the payload you get from the Copper, especially if you can trash the Curse later. Drawing cards is great, and tacking on extra card draw to cards you already have in your deck is even better. Pathfinding is at its best when it’s put on a non-terminal (especially a cantrip), because those are the cards you tend to have a lot of. 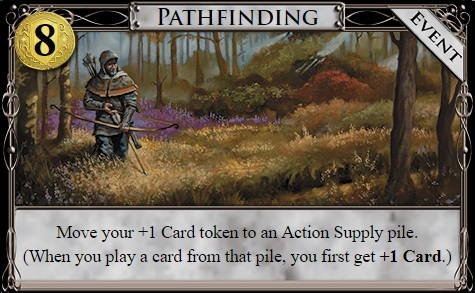 Pathfinding does cost a lot, but it quickly pays for itself by eliminating the need for putting extra draw cards in the deck, while suddenly boosting your deck’s consistency. At first glance, Overlord might just seem like an expensive Band of Misfits, which isn’t a very powerful card, but Overlord has a couple of use cases that push it up to one of the best cards in the game. The first is opening with an Overlord. You can have access to a $5 card, even if you didn’t open with a 5/2, along with whatever else you can afford on your first turn, if you just buy an Overlord on your second turn. This is strongest when there is a $5 card that trashes cards or attacks your opponent, because these effects can be meaningful even if you’re in debt. If you can open with the card otherwise, or if your only $5 options for Overlord are cards that make money, Overlord openings aren’t nearly as good. Overlord’s flexibility is not to be ignored, though. Its role can change as the game progresses, so you may play it as a trasher or junker early on and then something else when that’s no longer useful — in these cases you may even consider opening with an Overlord if the trasher or junker costs less than $5. The flexibility is stronger with Overlord than Band of Misfits simply because you will have more options to choose from, and those options are usually stronger because $5 cards are significantly more powerful than $4 cards.